This sense of oscillation between trying and not trying underpins much of the work of Vlatka Horvat, whose work is currently exhibited at the Battersea Arts Centre. In her work a particularly Sisyphean logic is conjured through the economic or diagrammatic vernacular of the instruction manual or informational guide. Failure and repetition become explored as playfully propositional as much as existential conditions of lived experience; tested out at the point between the “actual and staged, between experiencing and pretending”. 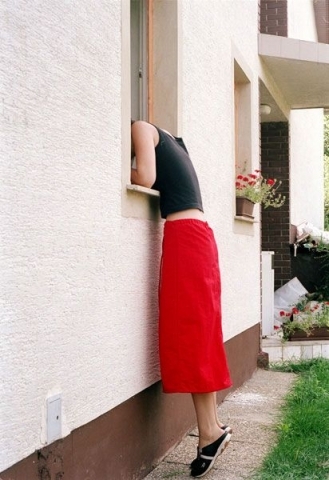 [iii] For example, in the photographic series Hiding Horvat attempts to conceal herself behind hopelessly inadequate studio props – in the crease of the corner of the room or by burying her head in her own skirt – which always fall short of her unrealistic expectations. Alternatively, in Searching, she repeatedly plunges into a plethora of unlikely hiding places, ‘losing’ her head in the hopeless pursuit of something that remains undefined, undeclared or seemingly unattainable. Her quest instead becomes an accumulation of potential solutions to a given problem or operates as a foil or Macguffin that enables the interrogation of the state of indeterminacy itself. The Sisyphean logic of an arbitrary assignment is explored further in a video work, where in a woodland location Horvat relentlessly tries to situate herself in the centre of the camera frame, tentatively shifting her position in the search of the perfect solution to her self-imposed brief. It is never wholly clear whether the task has been successfully completed. She eventually walks towards and then disappears behind a tree, where there is a brief interlude or pause before she reappears and the action begins again. Horvat’s work is often serial in nature where possibilities become endlessly flagged and then dismantled. Seriality undermines any sense of stable logic for the work through its entropic condition of equivalence, which depletes or deflects the charge of the individual iterations and allows for the co-existence of paradoxical propositions that render meaning undecidable. In the photographic work in particular, failing gestures remain as visible traces within each catalogued series, a visual form of sous rature that indicates a process always under erasure, where wholly inadequate actions are used to articulate an unrepresentable concept within the limited constraints of a given language. The failure of each repeated attempt operates as the momentum for the work, where unseen or unspoken restrictions become the impetus for the development of new permutations and performative solutions. Here repetition becomes generative, it always produces something new or different. According to Jean-Paul Martinon, “repetition or reiteration involves a movement towards the possibility of something else … repetition always invokes a disconcerting reinvention and a certain inventive mobility”. [iv] For cultural theorist Roger Caillois, an infinitely repeatable (yet also potentially open-ended) pursuit or action operates at the heart of play for, “the possibilities of ludus are almost infinite … what to begin with seems to be a situation susceptible to indefinite repetition turns out to be capable of producing ever-new combinations”. [v] The process of repetition inevitably confuses or breaks down the rhythm or logic within the activity, enabling the possibility for moments of irresolution to become fore-grounded or privileged. Within this disrupted, deconstructed or even inverted syntax of performativity, the task might become one of trying to produce an authentic experience of inbetweenness. Horvat’s work often has a sense of cataloguing or trying to exhaust the possibilities within a given rule; it is “structured as a predetermined system or framework inside which a more improvised, makeshift or provisional kind of activity takes place”. [vi] Whilst the rule serves to delimit or determine certain actions, it also functions as a point of creative pressure or leverage against which to search for unexpected translations or performative loopholes. Johanna Burton suggests that, “taking up a model of ‘system’ rather than ascribing to any one of its literal … permutations is to question the systemicity itself, to experiment with rather than adhere to any rigorously defined set of terms”. [vii] Politically speaking, this opening out of possibilities within a limited frame becomes a way of creating the potential for alternative modes of existence within situations that had been perceived as inflexible or irrevocably constant. Alternatively, each proposition is deliberately sabotaged and the failure of the task becomes a way of postponing resolution, a tactic for avoiding definitive declarations or decisions that could then disable the potentiality of the situation. For Horvat, "the event itself is always absent or does not take place, so the event becomes the act of getting ready”. [viii] Failure thus becomes articulated as a mode of ludic investigation that finds a certain pleasure in the uncertain space of the not-yet-known, an open space of potentiality where closure is traded in favour of endlessly unfolding permutations. [i] Iddo Landau, ‘The Paradox of the End’, Philosophy, Vol. 70, No. 274 (Oct., 1995), 555. [ii] See Landau, 1995, 560 – 64. [iv] Jean Paul Martinon, On Futurity, (Palgrave Macmillan, 2007),1. [v] Roger Caillois, Man, Play and Games, trans. Meyer Barash, (University of Illinois Press, 1958 / 2001), 31. [vi] Horvat, ‘Flagging Possibilities’, interview with Emma Cocker, Dance Theatre Journal, 2008. [vii] Johanna Burton, ‘Mystics rather than Rationalists’, in Donna de Salvo, (ed.) Open Systems, (Tate publishing) 2005, 67. [xi] Sol LeWitt, Sentences on Conceptual Art (1967) in Art in Theory, Harrison and Wood, 1992, 834.